[image|159] does not existWe're excited to be now stocking Grandpa's Feeders! 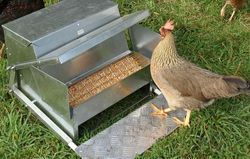 Having a Grandpa’s Feeders chicken feeder will save you time and money, protecting your chicken feed from pests and allowing you to leave the chickens to fend them themselves for up to ten days. After seven days the two bolts are repositioned so the hinged lid will close only half way. 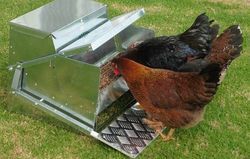 This enables the hens to get used to the lid and platform moving. Finally, seven days after this, the two bolts are removed altogether and your feeder is in its permanent mode. By now the hens will be fully used to the feeder and will be using it at will.